The hotel, books, cashmere, more books, tea, and a surprising visit. 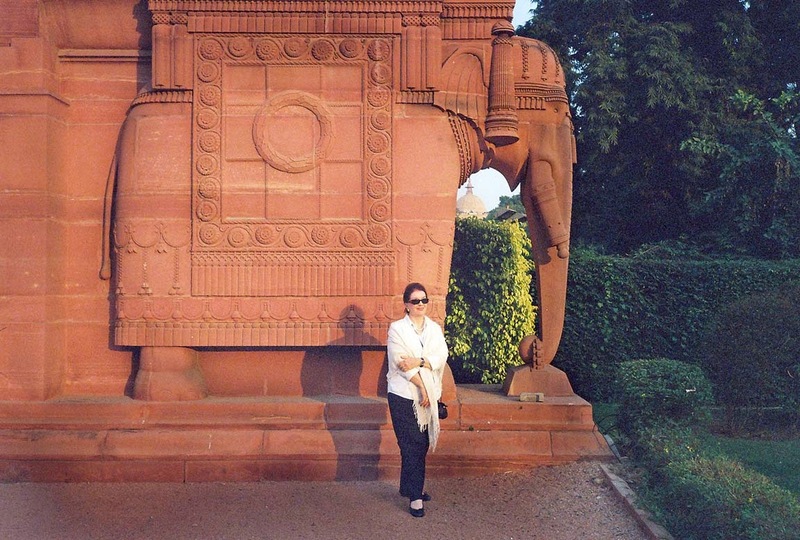 I recently returned from a visit to New Delhi. I’ve been traveling there since I was a student. I love India and travel there — always exploring new regions, new experiences, and meeting new people, rediscovering old favorites. I have new pictures and new places to introduce to you. 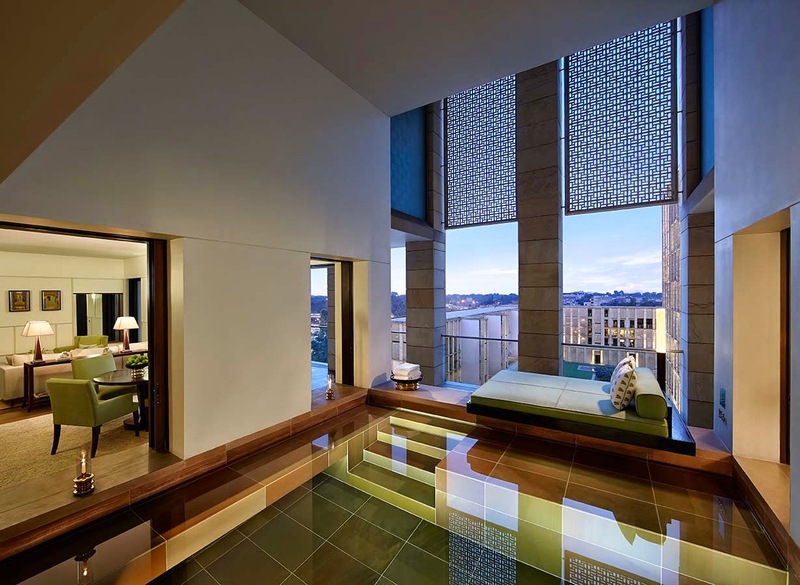 Come with me to the subcontinent to discover an architectural masterpiece, The Lodhi, my favorite hotel in Delhi. We’ll visit the best bookshop in India. I’ll spill my secrets and tell you where to buy beautiful cashmere shawls and the best Indian tea. And I’ve updated my best India books list. 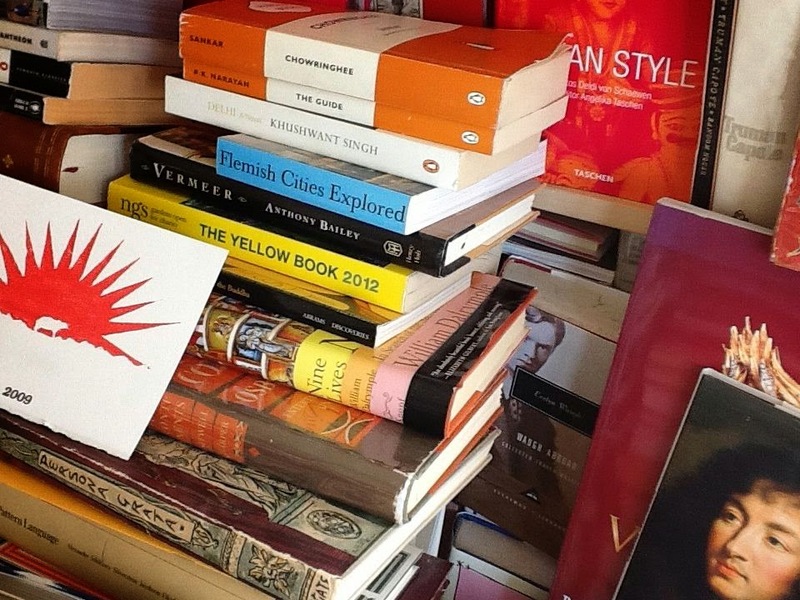 Books: this week I have two fantastic lists of books on India. One list was selected by Anuj Bahri Malhotra, the owner of the great book company, Bahrisons. The other is a list of my favorites, with new additions. I propose: this post is long and full of detail, information and insider tips on India. Print it out and read it like a magazine, perhaps. 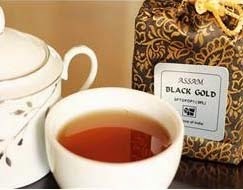 Or treat yourself to some Assam tea (or PG Tips, which I often enjoy), in a hot teapot. Perhaps a sip of mango juice, or coconut juice might be very apt and refreshing. Enjoy it—and I hope you love all of this information. Let me know. During my recent trip to New Delhi, I visited the Presidential Palace—a grand red sandstone structure designed by Sir Edwin Lutyens. I discovered this fantastic elephant sculpture near a private entrance. This was Lutyens’ way of highlighting Indian architecture motifs into his classical plan for Imperial Delhi. Designed in 1912 and completed in 1929, Rashtrapali Bhavan is one of the most fascinating buildings in New Delhi (and hardly visited at all by travelers). On 320 acres, it includes Moghul gardens, parade grounds, the president’s quarters, government buildings, galleries, statuary. It embodies Raj India. 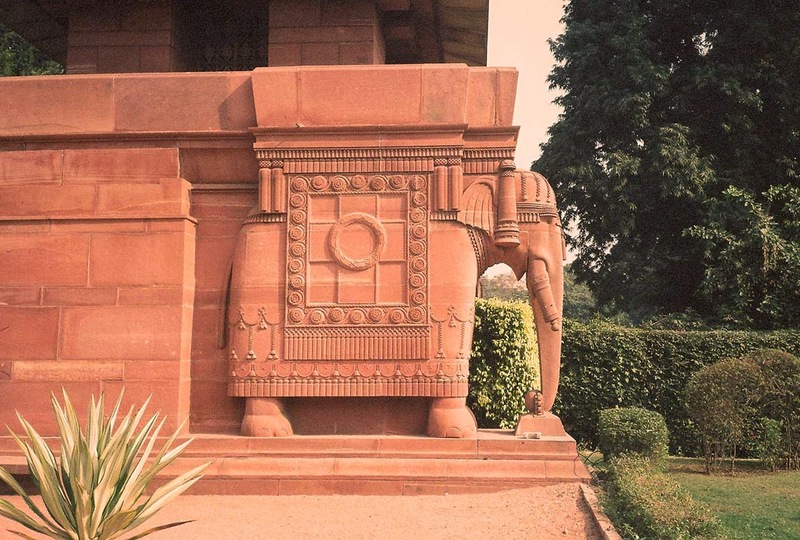 I discovered the fascinating way Sir Edwin Lutyens deployed Indian indigenous materials (red sandstone), and adapted Indian imagery in his entirely classical structure. 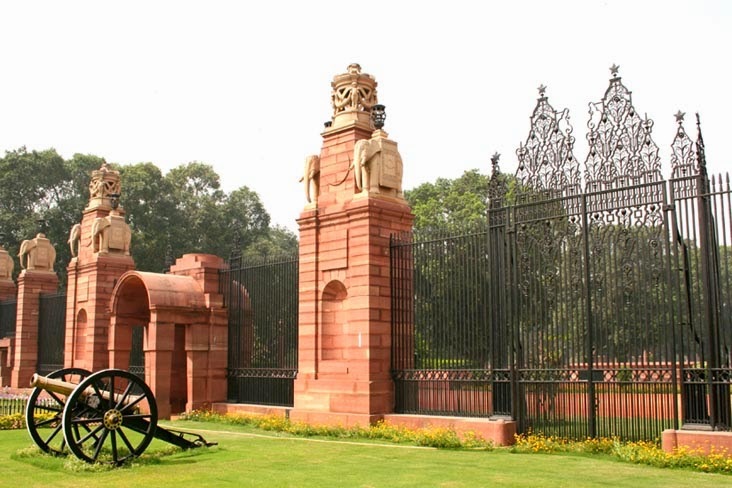 Insider tip for architects and designers: Visiting Lutyens’ Delhi is a must. Lutyens’ greatest work was the majestic Vice-Regal Headquarters. Working with the finest Indian construction company and craftsmen he incorporated Indo-Saracenic motifs, as well as Indian stone basins on top of the building as very dramatic (and very Indian) water features. Lutyens’ Palladio-influenced and rather austere classical buildings were modified to include Moghul chattris on the roof. Throughout the gardens are dramatic statues of elephants and fountain sculptures of cobras on pedestals, as well as bas-reliefs around the base of the Jaipur Column. A travel tip: For your next trip to India, I propose that you book online for a visit to the interior of the Rashtrapati Bhavan building. It’s open on a very limited timetable. Much of its original furnishings and interior architect designed by Lutyens is accessible. You can imagine the residents, Lord Louis and Lady Edwina Mountbatten and their attendants, entertaining and greeting officials and royalty. I had a Sunday afternoon private tour—and found it so fascinating, I did it twice. Lutyens is hardly mentioned in guidebooks or ‘must see’ lists. For designers, architects, and those obsessed with architectural heritage and Lutyens, it is a rewarding visit. Where to Stay Now in New Delhi—The Lodhi Hotel: I like to stay at hotels where I can rely on management and staff to provide me with privacy and low-key service. 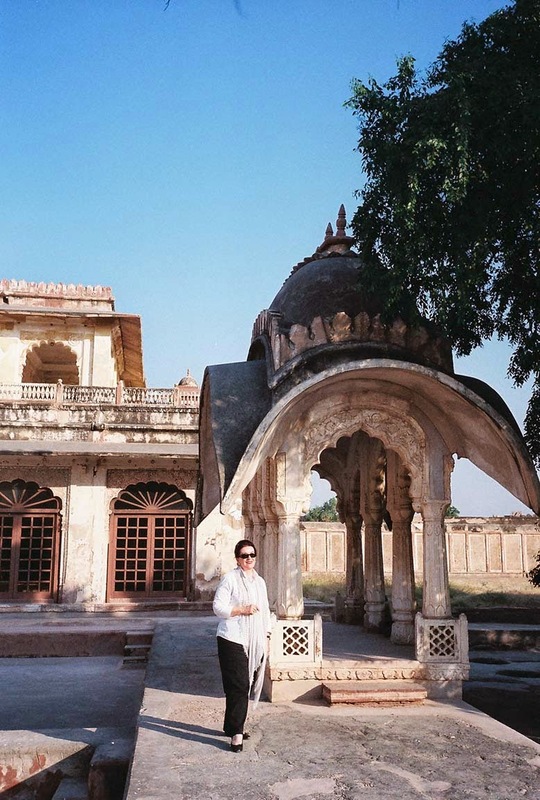 In particular, in India, I appreciate The Lodhi because Joint General Manager Robyn Bickford is such an insider. She'd been involved with the diplomatic world for decades and knows all the best sources. She takes care of guests, smooths the way, and provides outstanding drivers and other staff that make life in Delhi rather comfortable and efficient. I’ve written about The Lodhi before. 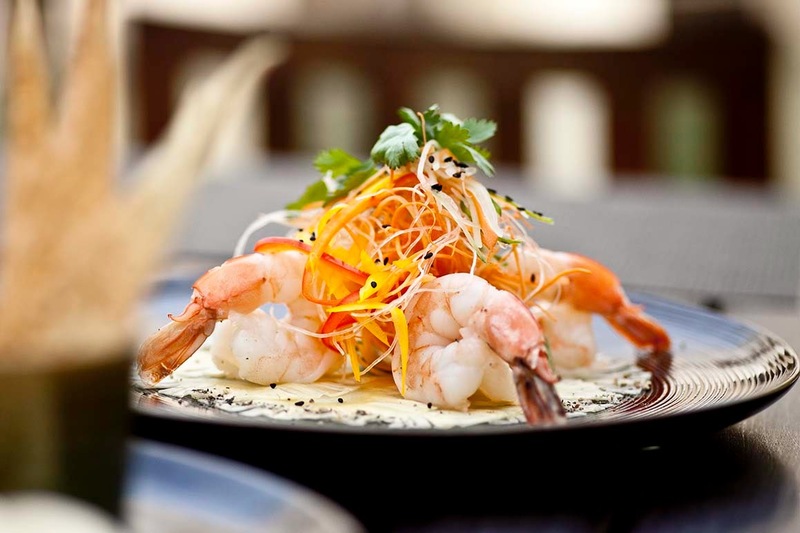 The hotel was formerly an Aman property—and it maintains that high standard of style and care. I find it extremely congenial. It’s quiet. An ethereal Meier-modern new hotel with a serene garden setting and elegantly delineated architecture is the new chic place to stay in Delhi. 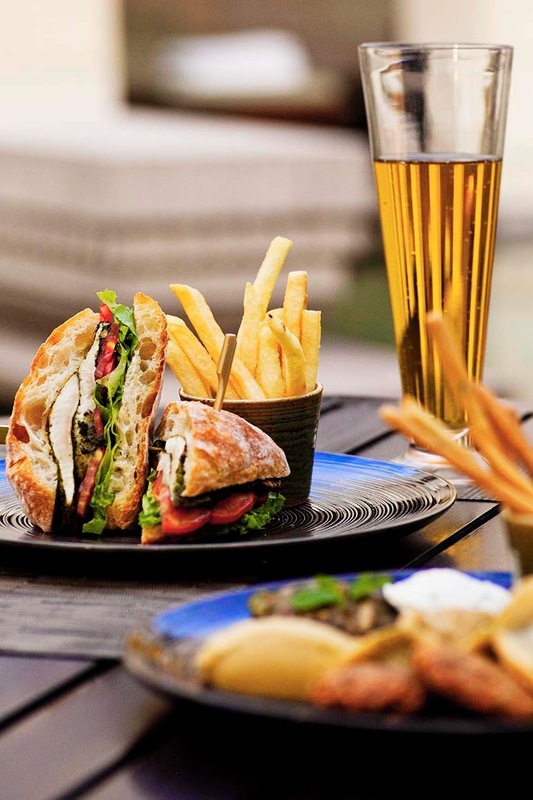 It’s The Lodhi, just four years old, and already a favorite of stylish young Delhi couples, worldly art collectors, and international travelers intent on getting to know the fast-changing and surprising new India. It’s a favorite hotel for Silicon Valley talent like art collector Komal Shah, a former Yahoo exec who recently joined the Asian Art Museum board. Top interior designers like L.A.-based Michael S. Smith, and Jean-Louis Deniot, with headquarters in Paris, land there on business trips. The first impression of The Lodhi is of massive walls of carved slabs of marble deployed with precision and superb restraint. An austere and highly refined architectural sensibility is at work here. Pared down and gracefully delineated, the walls of honed ivory-colored stone are reminiscent of the pale carved exterior walls of the Taj Mahal. India is always celebratory and ornate, and many travelers arrive specifically to immerse themselves in the excitement of hallucinogenic hues, and the jangle of music and crowds. For me, The Lodhi is very much in the Moghul tradition of generous hospitality—but it’s India with a modern style sensibility, one that is truly Indian and poetic, without the razzle-dazzle. . 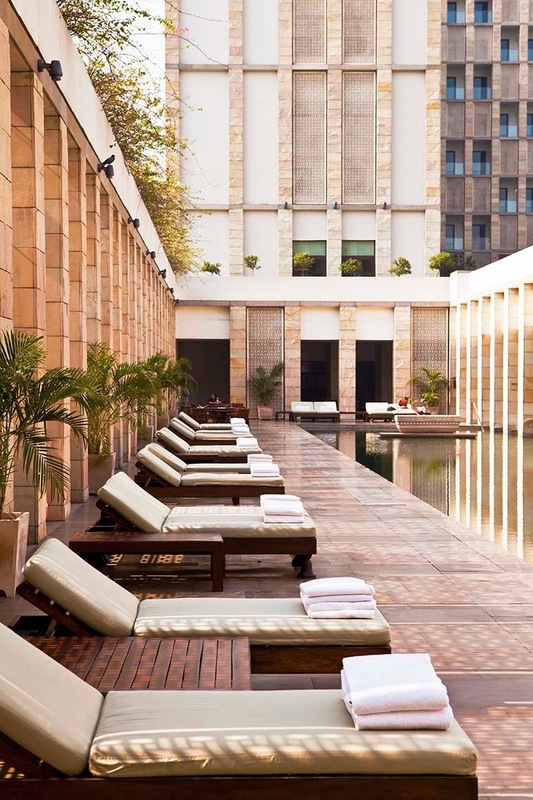 The Lodhi hotel property includes a large sheltered swimming pool, tennis courts, and outdoor spots for quiet reflection. Guests often use the pool in the cool of evening for refreshing laps. At the light-filled limestone entrance a large carved black stone water basin is filled with brilliant orange marigolds. A butler silently guides guests along an enfilade of silent hallways. In the suite, a graceful bedroom has an efficient series of adjacent wardrobes, luggage stands and dressing tables. Everything in the right place. The scent of fresh tuberoses wafts into the air. In each suite, through a tall shuttered door is a wide sheltered stone terrace. Each suite has a heated plunge pool and on a terrace that’s open to the fresh air. Privacy is perhaps the most precious travel luxury. The Lodhi feels like a personal residence. There are no obtrusive signs, and staff greets guests by name. Suites at The Lodhi have a private terrace with a panoramic view with the historic dome of Humayan’s Tomb in the sunstruck distance. The heated plunge pool is large enough for brief laps followed by repose on the cantilevered chaise longue. 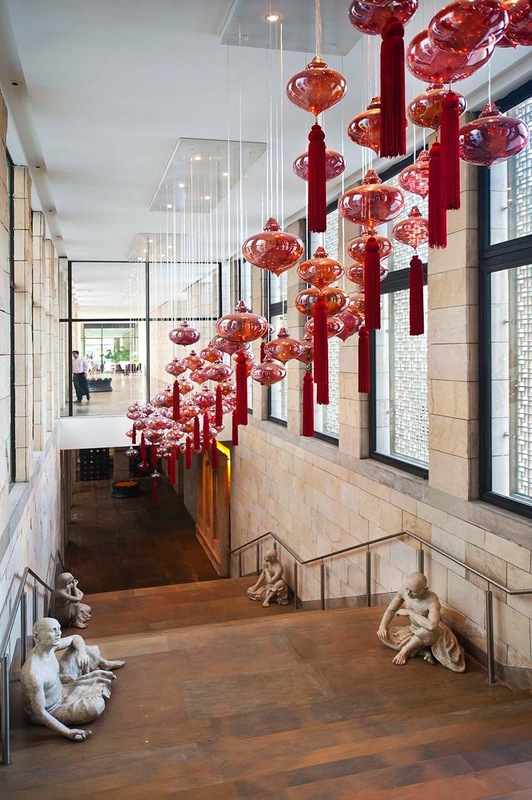 The Lodhi, a favorite for international auction houses, art dealers from London and New York, and museum types and art collectors from San Francisco, recently partnered with the Apparao Galleries of Chennai to showcase contemporary Indian art and sculpture around the hotel. Sharan Apparao, founder and owner of the Apparao Galleries, curates a revolving collection. 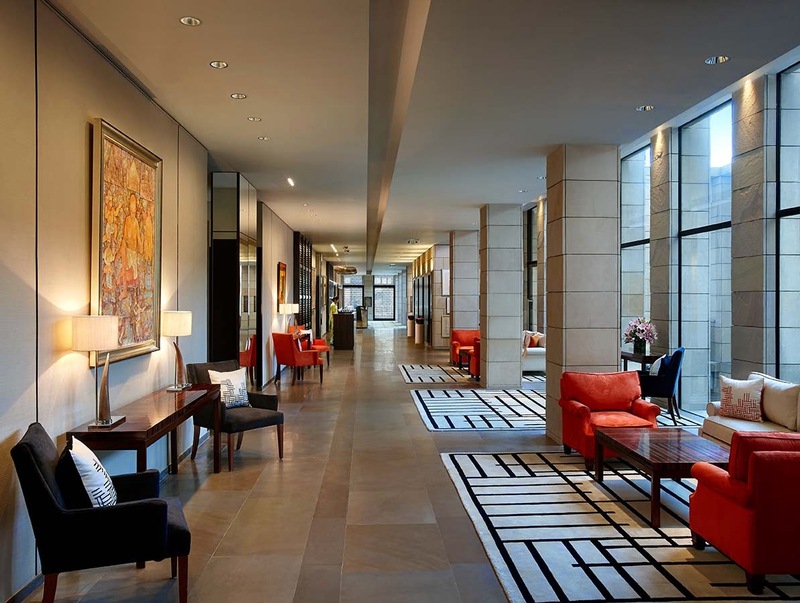 The contemporary art adds graphic interest and vivid color to the stone interiors. 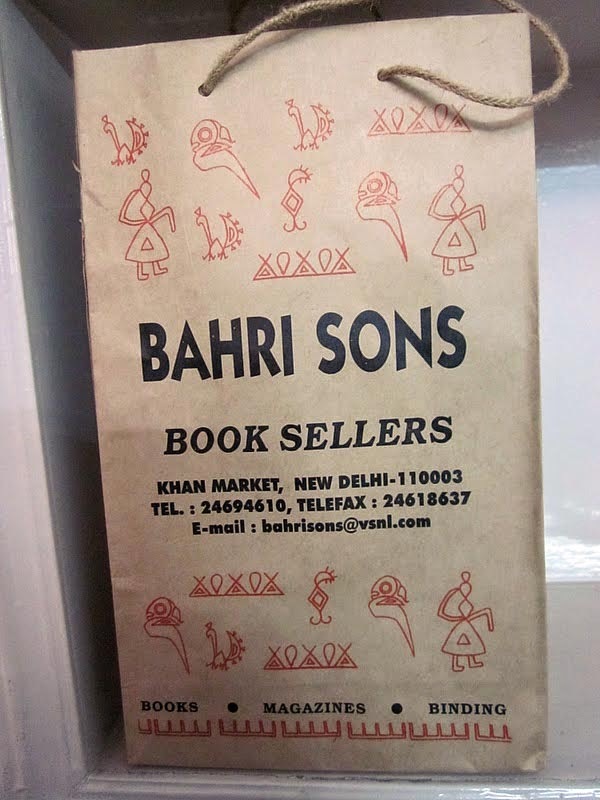 On my recent visit to New Delhi, I spent hours at Bahrisons, founded in 1953, the best bookshops (there are three) in India. My favorite Bahrisons shop is located at the entrance to Khan Market, a vibrant cavalcade of style shops and restaurants. 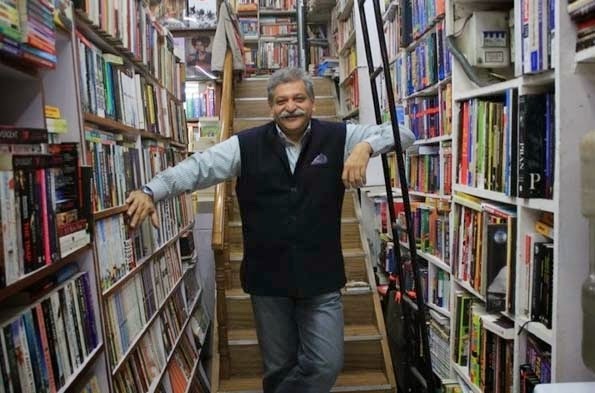 Bahrisons is crammed to the rafters with books—mostly literary, many best sellers, and books on Indian culture, history and politics. It’s very popular with the expats, with the diplomatic crowd, with students, and with politicians and lawyers from nearby offices. I linger among the stacks at Bahrisons for hours—looking through books on design, architecture, biography, and finding dozens of books to send back to California. Staff does an extremely efficient job of shipping. My recently purchased books arrived home before I did. The bookshop is so popular that they re-stock three times a day. Careful…they close for lunch from 1-2pm. I checked with Anuj Bahri Malhotra and he suggested the following list of books on India. “He knows India, he is a superb historian, and his writing is vivid and authoritative—and witty. Highly recommend,” said Anuj Bahri. The witty detective novels of Tarquin Hall, featuring detective Vish Puri. (www.tarquinhall.com). “Tarquin shows his love of India and Delhi in this amusing series. He knows Delhi today and it shows,” said Mr. Bahri. Delhi: A Thousand Years of Building by Lucy Peck (Roli Books) A highly detailed insight into Delhi’s architecture heritage. Well illustrated. Delhi: A Novel by Kushwant Singh (Penguin). “It’s irreverent and inventive, it’s magical realism. A bestseller,” said Mr. Bahri. Perpetual City, A Short biography of Delhi, by Malvika Singh (Aleph). Singh, a noted Delhi journalist, is also the author of a recent reference book on Lutyens Delhi. This is her love letter, very insider and full of lively anecdotes. Opinionated. Excellent. Delhi: Fourteen Historic Walks by Swapna Liddle. Heritage discoveries, secret walks and classic sites like the Red Fort, Lodhi Gardens and Humayun’s Tomb (I’ve written about it here). Trickster City Writings from the Belly of the Metropolis by Shveta Sarda (editor). “These young writers are fresh, they know Delhi, and they chronicle emotion, experience, events, some rather documentary,” said Anuj Bahri. Let’s say you’ve never been to India, and you’re excited and very curious and scared and nervous…and want to know more. Check through all of these lists and Mr. Bahri’s list. And start collecting the ones that appeal to you. Read non-stop. The information and knowledge—and sense of India—you gather and harvest will enrich your trip and explorations. I have a lifetime of books on India. I read biographies (the Maharani of Jaipur, Sri Aurobindo, Gandhi), history (all of William Dalrymple’s volumes), memoirs (Pamela Hicks), and many Indian fiction writers and dynasties of literary families (the Desai family) and many books on histories of the maharajahs and Indian life, films (Satyajit Ray) culture, music, architecture and textiles. I recently read The Guide by R. K . Narayan (Penguin) about small-town Indian life. Enchanting. I also found Chowringee by Sankar (Mani Sankar Mukherji) (Penguin). It’s set in Calcutta, and it immediately immerses the reader in its hullabaloo. I love the books of writers like V.S.Naipaul, as well as Amitav Ghosh, and Jhumpa Lahiri (writing about Indian expatriates in books like ‘The Interpreter of Maladies’)…her writing is exquisite. I also love Kiran Desai (“The Inheritance of Loss) and books by her mother, Anita Desai. Books I favor and have enjoyed are background, in-depth learning, rich detail, research, factual information always written with grace, charm, wit. ‘At the Court of the Fish-Eyed Goddess, Travels in the Indian Subcontinent’ by William Dalrymple (1998) is a wide-ranging series of essays on Indian life, culture, politics.‘A Princess Remembers The Memoirs of the Maharani of Jaipur’ by Gayatri Devi (1996) sketches a romantic view of her childhood, subsequent marriage to the Maharajah of Jaipur, and jetset life. She founded schools for girls and a grade school in Jaipur, and was instrumental in protecting and fostering traditional fine crafts and arts of the region. ‘The Raj Quartet’ by Paul Scott. These are the books on which ‘Jewel in the Crown’, the hit PBS show, was based.) Scott’s writing is wonderfully accomplished and richly sympathetic to all of his characters. British, insider, revealing. Quilts of India-Timeless Textiles by Patrick J Finn published by Niyogi Books. It is such a pleasure to learn more about crafts and decorative arts of India. This is is a great record with very clear photos of another dying art. Sam Miller, a young English writer, has written two books, Delhi: Adventures in a Megacity and A Strange Kind of Paradise: India through Foreign Eyes which are witty and fresh, and both eminently readable. I know you’ll want to read them all. And tell me your favorites. I love discovering new books. New Delhi is alive with fantastic shopping. I must say that for me shopping is not a major focus, though dear friends spend days finding Gem Palace jewelry, bangles, sandals, saris, Anokhi tunics, and handwoven fabrics, and beautiful adornments. Delhi has emporiums and stalls and shops and centers…and that is not how I want to spend much time in India. I want ‘only in India’ adventures, not a lot of shopping. An exception: cashmere shawls and tea (see below. And…Khan Market, which is near The Lodhi, and is bustling and colorful, with shops like Anokhi (block print shawls and dresses), as well as Bahrisons books. Kashmir Loom shawls and scarves are available at Barney’s New York stores around the US, and at many international stores and boutiques. But I prefer to go to the source—where every style is available. Robyn Bickford at The Lodhi suggested that I would enjoy meeting Jenny Housego, the co-owner of Kashmir Loom. I made an appointment to see the company's selection of fine cashmere, silk, wool and cotton textiles made for the Indian and international markets. 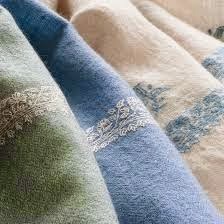 Many cashmere connoisseurs consider the company's shawls and blankets to be the finest available. Jenny, who is English and lives in New Delhi was formerly a textile historian, and worked at the Textile Department at the Victoria and Albert Museum in London. I arrived at the Kashmir Loom showroom. The company makes the most exquisite traditional shawls and scarves in handspun and hand-loomed cashmere. Newest designs include the pioneering use of shimmering metallic threads in hand-woven shawls. Gold, silver and rose gold shawls are very beautiful. The quality of the textiles is the best I’ve seen in India. I love embroidered shawls in very fine natural undyed handspun cashmere (think taupe cashmere with exquisite borders of contrasting silks)—but they also weave rainbow-bright shocking pink, turquoise, magenta, and indigo shades to brighten a winter day. 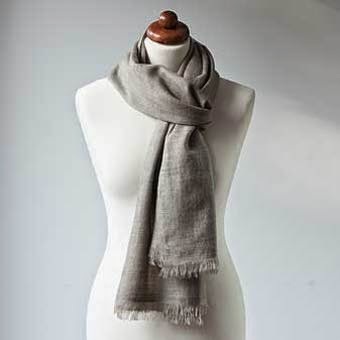 Prices from $150 for a natural cashmere scarf. I drink tea most afternoons around 4pm. My family is English—and in the late afternoon every day, I put the kettle on, warm up a classic white porcelain teapot, and add Assam loose-leaf tea to the pot. I love Fortnum & Mason’s Assam Superb, packaged in an elegant pale celadon canister. But in India, I always taste and buy special teas…that are only available in India. My favorite source is the company that supplies tea leaves to The Lodhi hotel— Mittal Stores. The selection of loose-leaf teas includes many Assam types and Darjeeling, Nilgiri and Sikkim, as well as Chinese. Very authentic and traditional. Inexpensive and light to pack in luggage. And so enjoyable at home. 12, Sunder Nagar Market, New Delhi is my favorite of their locations. 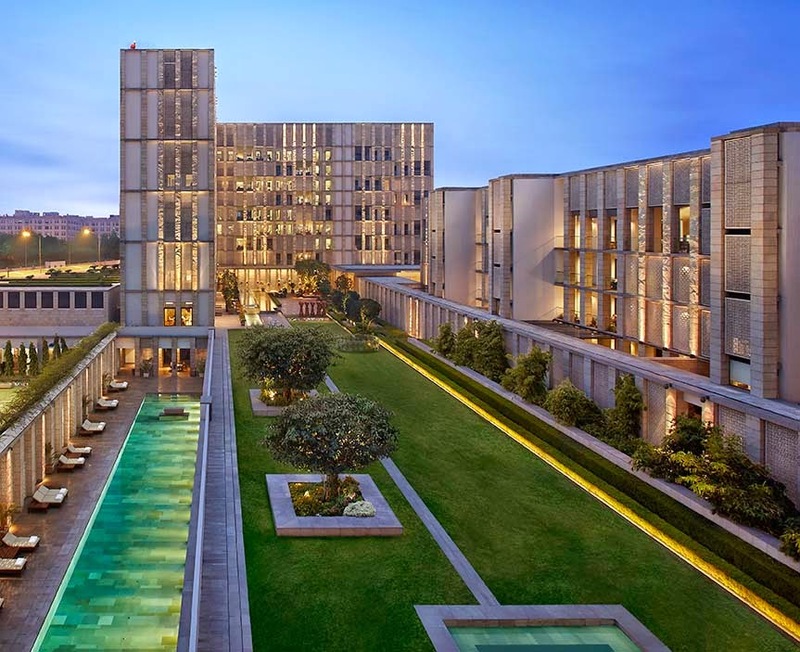 Note that The Lodhi has very close ties with the Aman hotel/ resort group, and travelers who are addicted to Aman resorts find The Lodhi very compatible and comparable. 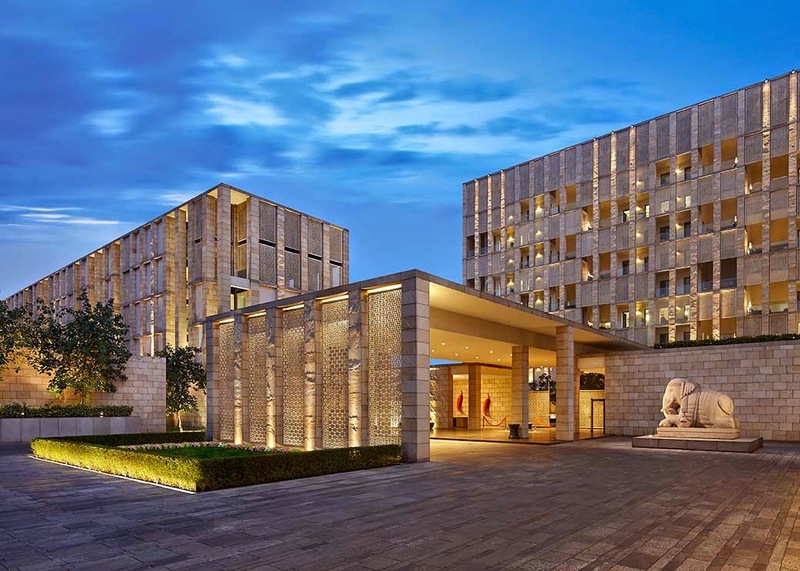 Like Aman resorts, The Lodhi is low-key luxury and ultra-private and discreet. 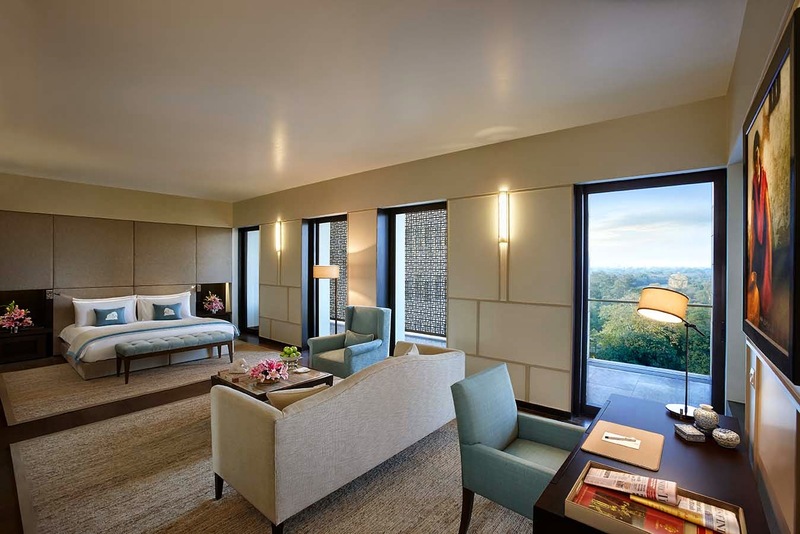 Just as Aman avoids glitz, so The Lodhi has perfected comfort, elegant simplicity, and friendly unpretentious service and attention to guest comforts. Images: Elephant statue photos by Diane Dorrans Saeks (and my driver). Images of Kashmir Loom, courtesy Kashmir Loom. Images of Bahrisons, courtesy Bahrisons. What a wonderful way to prepare for a trip to India. Thank you Diane, for paving the way in such grand style. Diane you have intrigued me immensely and I am so interested in reading both Daughter of Empire and The Raj Quartet! Hello. I just want to say how much I enjoy reading this post. The colour of blue sky in the first picture took my breath away. It seems a little bit cliché when I say there is no colour lovelier than the blue of the Asian sky at night. It is radiantly beautiful. 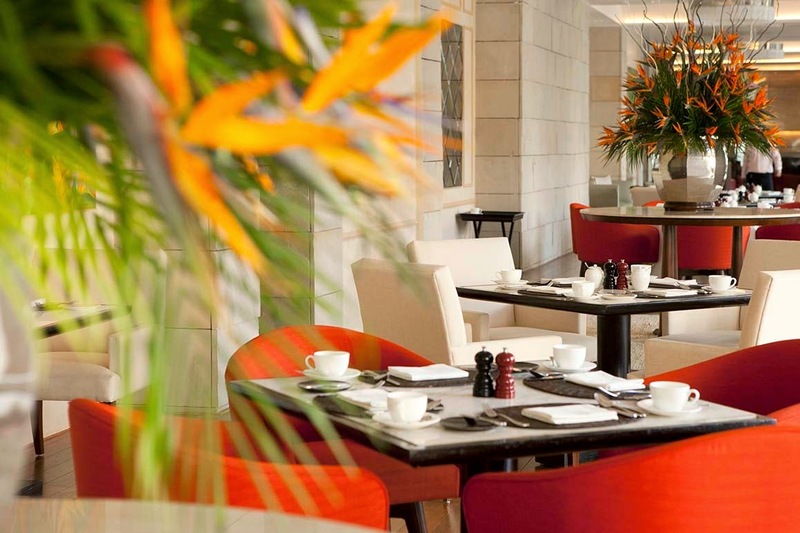 The interiors of The Lodhi hotel look absolutely first-class. I love the way you cherish and devour the books! I could spend the whole day at Bahrisons. 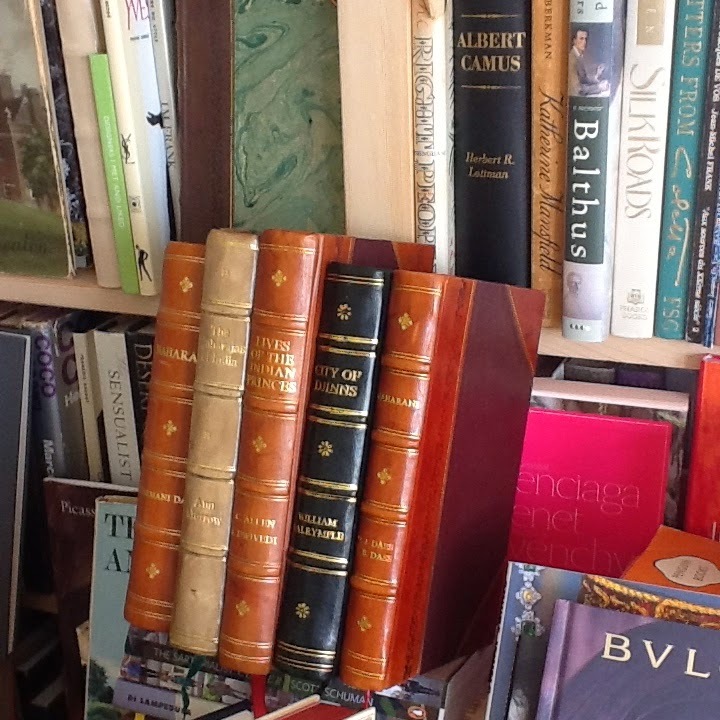 I'm sure that you would find a lot of rare, esoteric books there - this is just what I love about the old bookshops!! 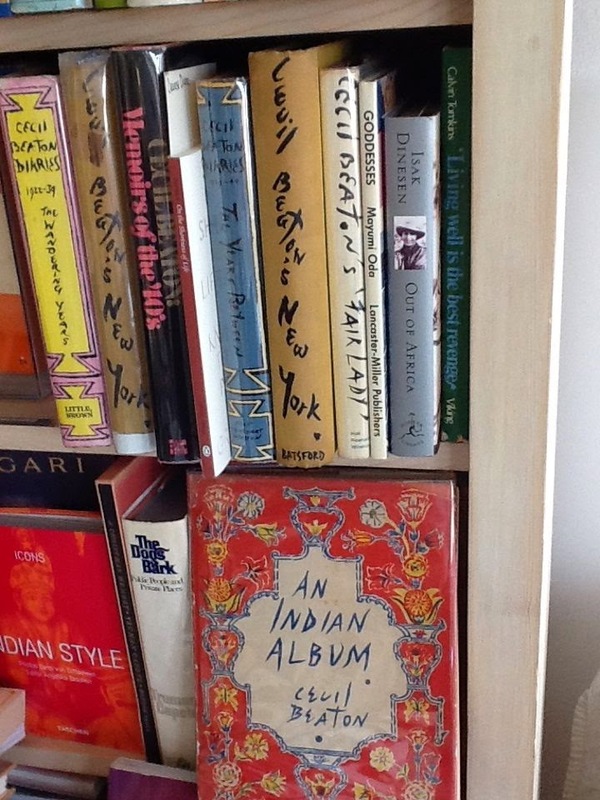 I love your collection of books on India. I'm currently reading an Indian related book: "Imaginary Homelands: Essays and Criticism 1981-1991" by Salman Rushdie. If you have not got this book, I would like to recommend it to you. The imagery and the way of life he captures about India is absolutely insatiable. PS. I think you inspire me to put my kettle on for another cup of tea! Ceylon tea is my favourite! I was just talking to someone yesterday about wanting to return to India soon. So reading your article Diane over a cup of tea was the perfect break and made me want to go even more. Thanks for the inspiration. Let's see, since your last post I have read The City of Djinns, Indian Summer and A Princess Remembers, all of them excellent and a good start. Next I want to read the Queen's Maharaja which sounds very, very interesting and then go back to read some of Dalrymple's other books and the full Raj Quartet. Some lovely photos of Rashtrapati Bhavan and great comments about Lutyens. Thank you! Many of the designs for furniture and lighting reproduced by me - his granddaughter - come from New Delhi. Please visit me at www.lutyens-furniture.com. Candia Lutyens. It's so wonderful to have heartfelt and enthusiastic comments about India. I'm happy, too, that my books lists..hello, Julieta…are inspiring, and the books can be entertaining and informative. Candia--yes, Rashrapati Bhavan is inspiring…and please be sure also to look back at the previous post which has PAUL WISEMAN'S HOUSE with Lutyens furniture in it…close up. The interior of RASHTRAPATI BHAVAN has been changed a lot and I did not see any furniture that was specifically Lutyens…in style. The rooms are used a lot, and only the old library looked quite original. Thank you all dear friends for your close reading of this story…oh, and I think MITTAL TEAS will ship tea to you…from India. They are the best loose-leaf teas. Also Kashmir Loom is a must visit. The quality is the highest--and in particular all of their designs are classic, beautifully crafted and somewhat understated. When you return home, they don't look like 'my trip to India' but rather very classic cashmere styles. I love their colors as well. I've looked at so many shops and so many collections of cashmere--and theirs is the finest, by far. Colors are elegant and would look beautiful in Paris, London, New York…they are very beautiful.